This is my friend Lami. She started working at my housing compound over 20 years ago and she’s seen dozens of short term missionaries come and go during that time. She’s an invaluable help as she cleans and cooks for us once a week. 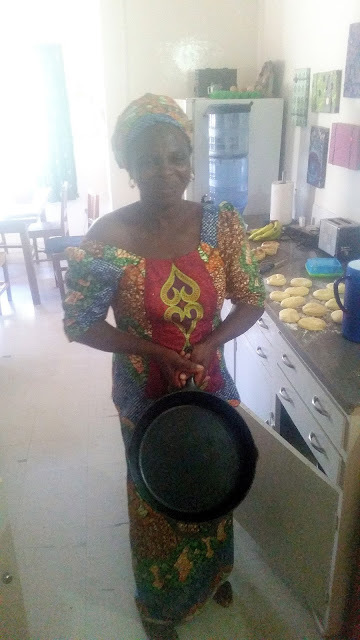 Lami cooks for me on Mondays, and I can count on her knocking on my door and calling out, “Salamu alaikum” (peace be on you -- originally an Arabic blessing that has carried over into Hausa) about 8am. We greet each other, then ask how the other’s family is, how the weekend was, and how we slept the night before. We finally get around to looking over the shopping list I’ve hurriedly put together just a few minutes before, making sure that she can read my writing and understands any specialty items I may have written on the list. We also chat through the dishes I’d like her to make for me. I’ve found that when I stick to her well-known repertoire of recipes, the results are almost-always guaranteed to be delicious! 1 container of plain yogurt (which I will use as starter for my own yogurt. This is really the only source of fresh dairy available so when we have a "runny stomach," yogurt is a great follow-up to the strong antibiotics. I bet that looks a little different than your grocery list! No meat, no packaged products, very little dairy. But that's a pretty normal shopping list for me! So after giving Lami money to shop with, I headed out the door to work and she headed off to the main market for vegetables, the one store in town that sells fresh dairy items, the Western-style (ish) supermarket for the canned items, and the local provision shop for the rice/flour/sugar. I walked back in from work about 1pm to the smell of baking bread and frying onions and garlic. I think those are some of the most heavenly smells! She was making homemade English muffins and this fabulous carrot/cilantro/lentil soup that I absolutely love! "That's fine. It doesn't really matter to me. I think there's a big pan in the cabinet if you want the pan to be very hot." "Oh, that one! It's eaten too much!" "You know that big, big one that's too heavy. It's taken too much food. That's why it's so big!" "So if you're missing any food, you check the cabinet. You'll find that pan has eaten it!" I've never heard that a 16" Lodge brand cast-iron skillet got to be so heavy because it ate too much! I guess there's always a first time for everything! Turns out, that cast-iron skillet was brought over by a missionary many years ago and it's been passed down to various other missionary wives. The current owner had overhead me complaining about not being able to make good cornbread without a cast-iron skillet and she agreed to let me borrow it while I'm here. On another note: I'm amazed that this woman can turn out loaves of bread in 90 minutes flat--including mixing (forget measuring anything! ), kneading, rising, and baking. I am super spoiled by her homemade bread. And if I happen to be home while she's cooking, I ask questions about her life and family, or she tells me how it used to be in Nigeria or within the mission community. I've learned a lot from her during the year she's worked for me and I am proud to call her my friend. Medical questions like you've never heard before!